As an organization that is working to abolish the use of imprisonment, policing, and surveillance, Critical Resistance stands firmly against all expansion of cages and for resources that enable dignity and wellbeing. Currently our chapters are fighting cages through CR NYC’s work to close Attica prison, CRLA’s 10-year campaign against jail expansion in Los Angeles, and CR Oakland’s work to ensure no new jails in San Francisco. We stand in solidarity with our partners at California Coalition for Women Prisoners as they hold a vigil outside CIW prison this Saturday (more info below), amplifying the call to release people from the California’s women prisons and halt decades of preventable, premature death. We believe that all jails and prisons target poor people of color and are toxic to the health and wellbeing of those held within them as well as the people and the environments surrounding them. 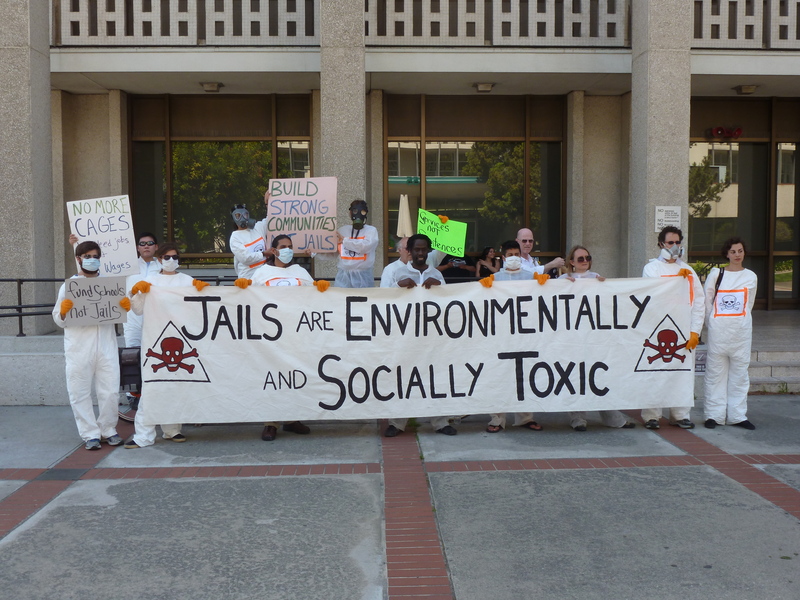 Since 1998, CR’s campaigns and coalitions have changed the debate over prison construction nationwide, including integrating environmental justice and anti-prison approaches for the first time in California with the campaign against Delano II prison (listen to “Critical Thinking on Abolitionist Strategy,” here or read “Joining Forces,” here). The imperative to link environmental justice and abolition remains a crucial and core part of all of our campaigns against cages. 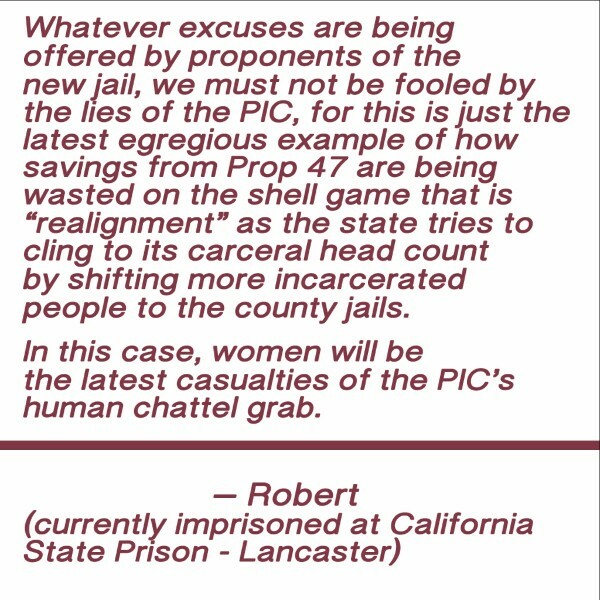 Our Los Angeles chapter is at a pivotal moment in their jail fight as the LA Board of Supervisors is still seeking to build a new women’s jail in Lancaster (named “Mira Loma,” in far east LA county). We know the environmental impacts of this new jail would be devastating and believe that the $3.7 billion allocated for county jail construction would be better invested in life-affirming resources for Los Angeles communities. We have solicited testimonies from people imprisoned in Lancaster who also stand against the proposed jail. On October 11th, CRLA and the LA No More Jails coalition are mobilizing to the Board of Supervisors to reject this jail plan and will take these testimonies with us. Are you in the LA Area? Do you know people in LA and can activate them? Get involved to stop this jail and check out the events below. The timeline for the proposed jail construction is moving quickly and we have a small window in order to stop this jail on environmental grounds. Contact CRLA now. Read these imprisoned people’s statements: One aspect of our campaign to stop construction of the women’s jail in LA County is to fight on environmental grounds, citing issues and hazards with its construction and operation in the areas of water supply and quality, air quality, and hazardous waste. We solicited testimony and analysis from contacts who are currently imprisoned in the Lancaster area because we are gravely concerned about the violence of the proposed jail and the risks of Valley Fever in that area, including for those who would be imprisoned at Mira Loma. Check out their responses. Correspondence with imprisoned people is an important way we solicit information, testimony, and analysis from those impacted by imprisonment. CR Portland, CR NYC, and CR Oakland currently operate regular mail nights where volunteers send resources to prisoners – contact us if you’d like to volunteer! 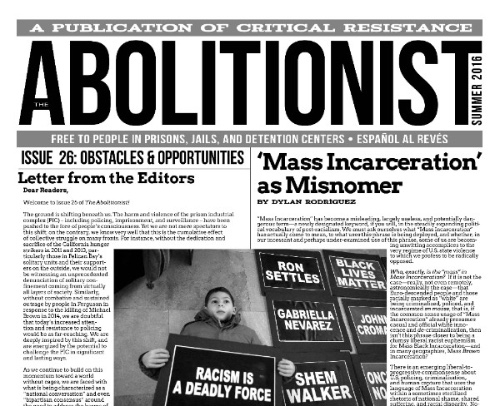 Subscribe to The Abolitionist: Outside subscriptions enable us to send this valuable political tool to over 5000 people in prisons, jails, and detention centers for free.